Disclaimer: *I reserve the right to change this team at any time. Any changes will most likely be confirmed on FPLH's Twitter account. 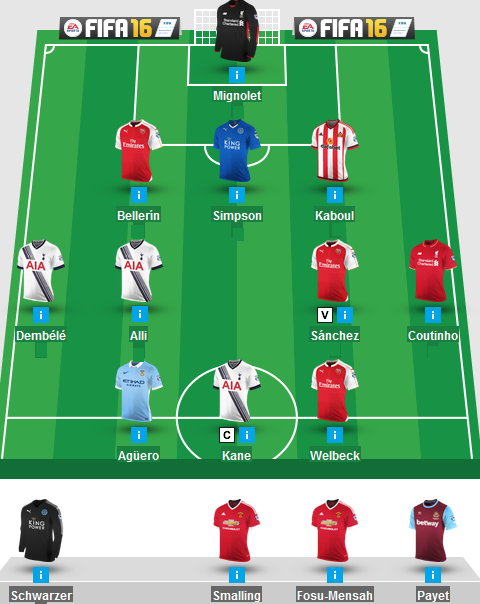 I was content with how Double Gameweek went with a knock of 136. 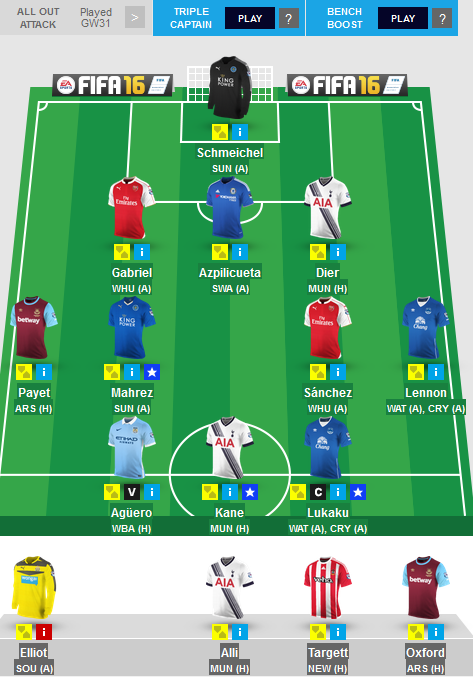 I had to use my wildcard which meant I couldn't triple captain Sanchez. C'est la vie. On count back had i taken a -8/-12 hit I probably would have scored a similar figure so I'm not too fussed. The main thing is that I have the BB and TC chips still at hand. 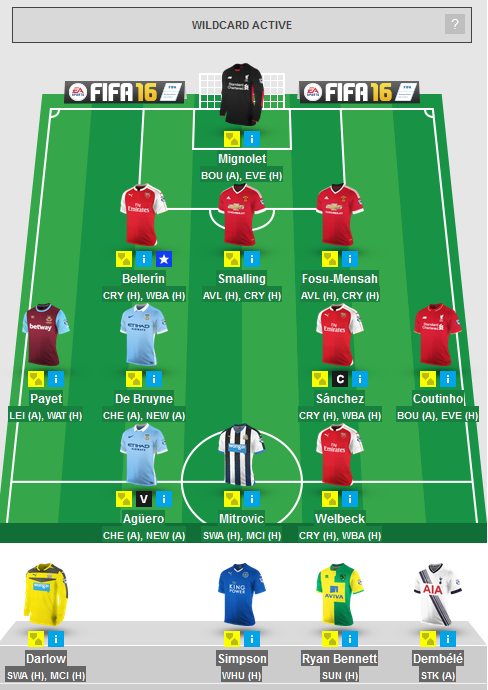 Speaking of chips, I will use bench boost in Gameweek 37. Yes, I could "TC" Sturridge then, but I'm concerned that he won't play a full two games despite his scintillating form of late. On a side note, I had to re-buy Kane and Alli ("HurriKaneAlli") due to Spurs' momentum even though they have no Double Gameweeks. I have decided to use the TC chip in Gameweek 35 due to a number of reasons. Spurs need to win and have shown fine form of late. Kane has spearheaded their success. They are free scoring and face a WBA team that have nothing more to play for. My only other time to use TC would be in Gameweek 38 when the season would be effectively over. Spurs have something to play for and it's for this reason I have decided to TC Kane. Crucially with 4 teams having blanks in Gameweek 35, any significant returns will be accentuated - the next best thing to it being used in a Double Gameweek. Yes, you read that right. I made a long-awaited spontaneous move! No need to rub your eyes... "WILDCARD ACTIVATED". It was never part of the plan to use it during a week in which I was keen to use one of my chips. But the fact of the matter is that I bagged a bad red arrow in Double Gameweek 33 following my failed purchases of Lukaku (c) and Lennon - I fell down by over 100,000 places. Ironically the two Evertonians could now be doubts for their upcoming game and with four other players who are also doubts or unlikely to start I had to take a risk and use my wildcard. Was I willing to risk a -8/-12 with no thought for GW35? Of course not. Plans are there to be redrawn or ignored. 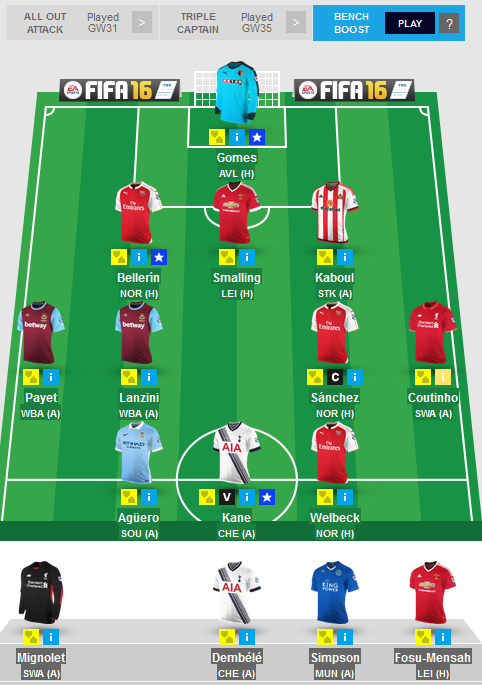 The aforementioned quagmire meant that I had an opportunity to build a wild card team for DGW34 and "Blank" GW35. I will still use one of my chips in DGW37. As for the other chip (most likely Triple Captain) I could use that for the final Gameweek of the season and hope for a random Theo Walcott hat-trick, right? I hate these blasted chips. I was mindful of the fact that some DGW34 players have blanks in GW35. This meant that I didn't buy Carroll or top up with three United players. It's now or never for Newcastle, so Mitrovic was worth a shout, alongside a rejuvenated Welbeck. Liverpool are plagued with rotation as a result of their European adventure. I wanted a defender, but Mignolet seemed the "safest" pick at the back. I could have opted for Coutinho or Firmino but the latter hasn't played much of late. I had to get de Bruyne as he has proven to play well with Aguero. In terms of defence, Bellerin and Smalling are players that I have wanted since August, but have only now been able to accommodate both. I wanted guaranteed GW35 Spurs and Leicester cover so I somehow managed to squeeze in Dembele and Simpson. Darlow and Bennett are bench fodder with the latter in line for DGW37. The downside to all of this is that I sold Kane, Alli and Mahrez - they have no Double Gameweeks this season. 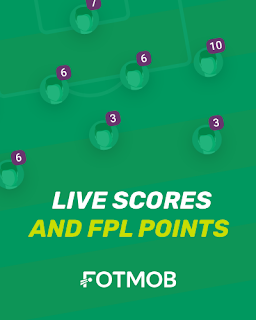 For more Double Gameweek insight, be sure to check this out. It's been almost a year but the Double Gameweeks are finally here! 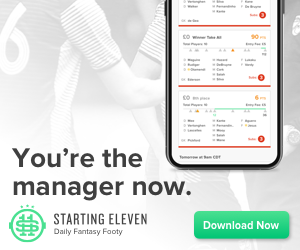 This is the business end of the fantasy football season, where zeroes can become heroes and cheeky punts can fall into your hands like gold dust. This week saw many FPL managers activate their wildcard in the hope of constructing a team that can work for the remainder of the season. The problem with that plan is we have two months worth of Premier League football left! Such long term planning isn't feasible, especially if it means selling all of your Leicester and Spurs cover when we still have a two-way title race on our hands. There was no question that I wanted Double Gameweek 33 cover but I wasn't going to take big hits for two teams that have a blank in two Gameweeks' time. Palace have been horrific since the start of 2016 - players lacking consistency, hit by injuries and prone to rotation. Their two home fixtures over the next week and a half equates to fools gold. In fact, at home they're just about scoring a goal a game, yet conceding more than a goal a game. To top thing off, their Double Gameweek 34 fixtures include visits to Old Trafford and the Emirates - no thank you. Otherwise, Wickham, Cabaye and Sako would have been of interest. It just made sense to look at Everton. Granted, their form hasn't been that much better than Palace's, yet the Toffees attack prowess from August has been present. Yes, they sit 12th in the PL table, but in terms of goals scored they are 5th best. What makes their players all the more tantalising is their three allocations of Double Gameweeks - 33, 34 & 37 respectively. This comes with added risk - with their fixtures being crammed in their players will be prone to rotation, which is why I have only bought two Evertonians. Lukaku was obviously a must. His goals have come in spurts this season. I am hoping that he can rediscover his touch against two teams (Watford and Palace) who have nothing else to play for this season. He has no pressure on him. It's time for fun. Vardy had to go due to his lack of goals of late (25% strike rate in the last 16 Gameweeks). To fund a move for Lukaku I decided to sell Yaya. I was reluctant to sell another prospective DGW'er (34) but with the recent comments in the press about him and his injury issues I decided to ditch him. With over £7M to spend on a replacement for Yaya, I had to look back at Double Gameweek 33. Barkley has been too inconsistent and not worth his price tag. I wanted a player that has shown form of late, is a differential and would let me free up funds for DGW34. Lennon matched the brief. Sure, he didn't get returns against Arsenal and United but prior to that he was showing his capabilities with 4 goals in 5 league games. If he fails to perform, I wouldn't be too bothered, he is effectively a punt pick. The extra unlocked funds will hopefully let me acquire United and Liverpool cover for Double Gameweek 34.